will include updated text and photographs and will mark the 50th anniversary of the guide and the association. We will post ordering information on our website soon. So a new edition is in the works. Hooray! I got a request for information about a certain chandelier. 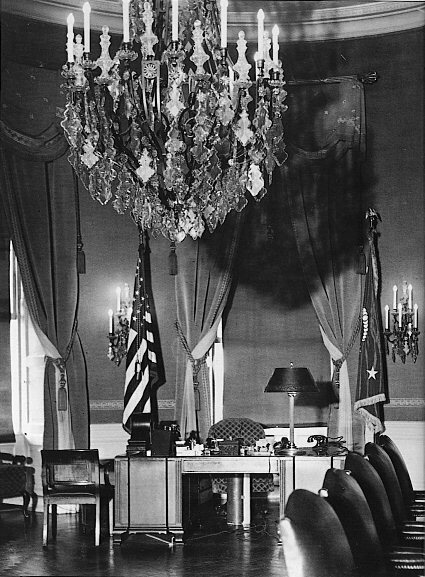 The WH is not good about explaining where furnishings have gone, but if anyone happens to know, I’d be grateful. 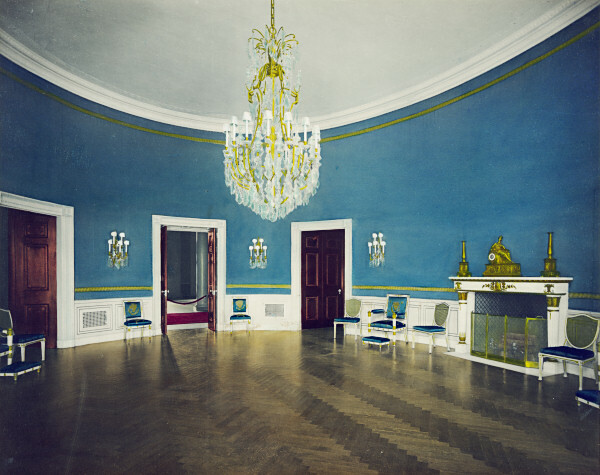 I’m trying to find more information (any information, really) about the original French Renaissance chandelier than hung in the White House’s Blue Room circa 1902. It was removed during the Truman renovation, and I’ve no idea what became of it. More to the point, however, I’d simply like to know more about it (the maker, the dimensions, and so on.) It was a beautiful monstrosity, way out of proportion to the space–which, I think, became the reason given for its replacement. There are only a few places in the mansion it could be, and it doesn’t seem to be in any of them. Big chandeliers being rather out of style, it’s likely been retired. It seems unlikely that has been moved to another government building. So, in all likelihood, it’s in any one of a dozen government warehouses, collecting dust. In 1979, the Carter administration installed 32 solar thermal panels on the roof of the West Wing to provide hot water for the building. In 1986, the Reagan administration removed them when the roof was resurfaced. So what happened to them? Scientific American has a detailed story. Politico has an article about the Michelle Obama East Wing office that includes a couple of good pictures that I’ve added to my page on her office. Obama, who redecorated the space last summer, has gone for something more casual than the gold tones of the Oval Office: an off-white, overstuffed, living-room-type couch — with floral and other printed pillows — along with two brown-and-cream-patterned chairs. The space is painted a warm, cozy peach color, and the windows feature plantation-style shutters rather than curtains or blinds. I’ve changed the front page for August to reuse an image from back in September 2008 (as you can see from the gallery). It’s one I’ve always liked of visitors coming thru the lobby in the East Wing.